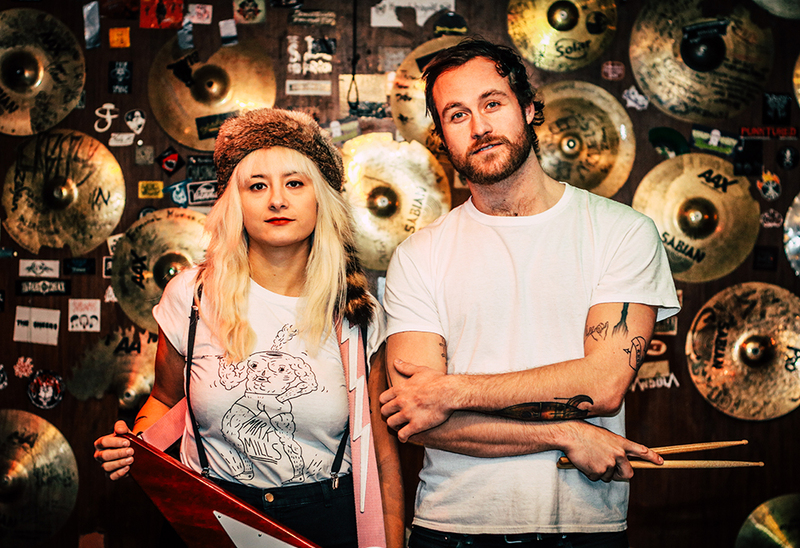 Miesha & the Spanks are the Calgary-based guitar-and-drums duo of Miesha Louie and Sean Hamilton. Their latest riff-rock effort, Girls Girls Girls, is out now on Saved By Vinyl. Louie gave us a tour of her favourite Calgary spots. Location photos by Michael Grondin. Galaxie is long like a train car, with bottomless toast and hash browns. It's built to breed regulars. I moved to Calgary in 2002 and have been eating there ever since. I bring friends from out of town, bands on tour — you name it. Sean made me breakfast there this morning. When Sean isn't playing in every band in Calgary, he's at Galaxie making food. Along the Elbow River near Stanley Park there's a long row of angled concrete slabs, that locals know as Banger Beach or the Slabs. The deepest part of the river is right here, calm and perfect for an afternoon swim. Dirtbags and suburbanites alike fill up the concrete beach, soaking in rays and blasting tunes, while rafters float by or dock to join the party. Home & Away is just down the hill from our jam space, so we do a fair amount of eating and drinking here. It's a sports-themed bar, but not in an annoying way — they have a full wall lined with retro skateboards marking their evolution, and the floor is made of old gymnasium floors. We love the fried chicken! Sarmad will always put a Habs game on for me, which I'm forever grateful for in the "C of Red," on the "Red Mile," where everything is… red. On Sundays the skee-ball and basketball hoops are free, and it's always family-friendly, so my seven-year-old niece likes to hang here too. We probably hold every band meeting at the Ship & Anchor pub, as well as every birthday party, and all of Sean's first dates. The Ship is another place that makes you into a regular, and they throw the most epic Regulars' Party every September to say thanks. In summertime, the patio is a hub to find people headed to the river, or just to make new buds. They've also hosted our Girls Rock Camp finale showcase for the last three years — the only time you'll find the ship full of teenage girls and proud-crying adult women. Calgary may have a few sweet pinball machines spread across our city, but never, ever has there been a bar dedicated to pinball, until Pin-Bar. It's brand new and I've only punched my initials into four games so far, but I'm planning to conquer Westeros with high scores when we get back from tour in April! One of two film photo booths in Canada, you can't visit Broken City without four dirty loonies. The stories it could tell! Broken City itself is a staple in Calgary's music scene, with weekly live shows and the Calgary spinoff to Halifax's Rockin For Dollars. It's also the notorious host to Sled Island's unofficial karaoke after-party. I think a lot of people have fallen in love in that photo booth. Tubby Dog started out as a hot dog night behind the bar at the Night Gallery, a long-gone and legendary Calgary live music/DJ venue. A lot of their current menu is from the old days — potato chips, space cheese, bacon (otherwise known as the A-Bomb) — plus some rad newer creations with seaweed and wasabi. Now they're a live music venue all their own, and one of the few that can host all-ages shows. That makes it sound recent though; they've been doing this for over ten years. There are not a lot of places anywhere to watch a rowdy punk band while eating an over-stuffed hot dog, drinking a PBR, and playing Street Fighter II. Did I mention they have sweet arcade games?